In February this year this demo (or album i would call it) came out and from the sample i heard i got inspired to check this out, i had not heard from what i recall the first demo but i heard Ghost Kommando where Kommandant Apokalyptron (Or Karnov as he called himself there) was the second half of the band & GK did some great and twisted metal for sure so i had hopes up for this early on. Now after listened some times on this tape i can say it full filled my hopes not that it is directly similar with GK but on its own more sober (but very raw) smolky grim music. 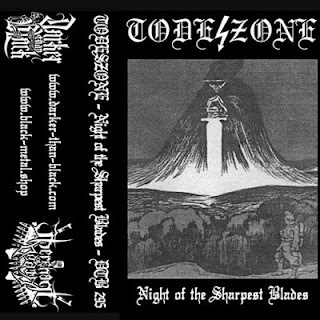 It is black metal but a quite personal kind of it so compare it to some other band is not too easy... not that it matter though. Either way it is great and it grows good from each listening as its not the most welcoming or easy to digest which i like, the tracks has a enough of range of diversity (in speed,ambience etc). The opening track is one of my favorite songs with has a kind of RAC militant drum beat to it combine with a ultra distorted vocals, a war march you can say and many tracks has this attitude. Quite primitive and brutal riffs but with a solid sense of composition. Last song " The Halls of Immortality" is the longest and most ambient (in a way) and it serves as a fitting ending track. First time i looked at the track list i feared (14 songs!) that it would out last its welcome but the songs is pretty short (plus they have good dynamics together) so that was never an problem. Production is heavy on the raw distorted dark sound-scape but it sounds great (and inherits a nice atmosphere) i feel but this typ of sound is an acquired taste i suppose. 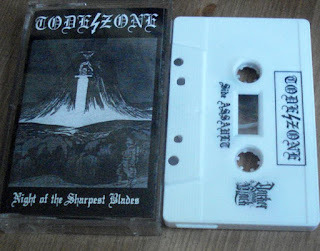 A rehearsal tape came out this spring/summer to which i guess highlights some songs for the coming real debut album which will be released via Darker then Black (as this tape) and Final Agony. Good bleak militant raw metal from Switzerland!